Heirloom pepper (left) and tomato (right) seedlings were sprouted in recylced barbecue chicken containers. It worked quite well. I used a couple of heating pads for bottom heat and the seedlings were sub-irrigated (aka self-watering). I removed the container hoods after the seeds sprouted and the seedlings were above an inch tall. I need to find many more pop bottles for planters and a lot more light garden shelf space. When the weather is warm enough these plants will go to new homes in the neighborhood. My plan is to donate them to local schools and religious institutions here in Bay Ridge, Brooklyn. Please spread the word if you live nearby. These are heirloom tomato starter plants potted up from seedlings on March 26. 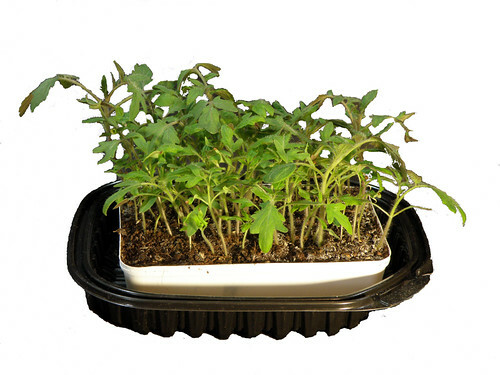 They now look like tomato plants and already have well formed root systems. 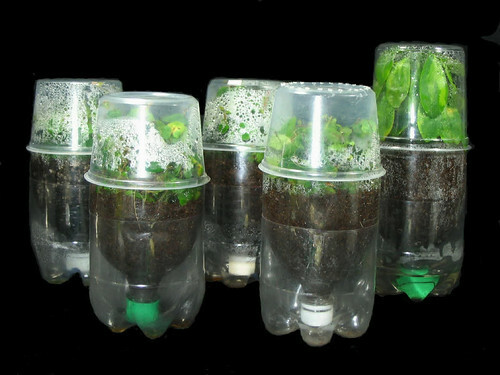 These sub-irrigated pop bottle planters aren't the only way to grow starter plants but it's a good way. When the weather is warm enough, I will plant them in sub-irrigated boxes or buckets. Later this summer, there will be tomatoes like these to eat. These are some of the first heirloom tomato seedlings planted in sub-irrigated pop bottles. As you can see, I planted them deep (just up to the first leaves). They are growing under 40 watt fluorescent lights. Hopefully they will develop some caliper (yet another learning opportunity). Stay tuned. I will post their progress. This is how they look after one week. These are the first seedlings started March 6 and now ready for potting up into sub-irrigated pop bottle planters. They are Yellow Brandywine heirloom tomato plants. These seeds were propagated in a sub-irrigated planter made from recycled cookie containers (one sleeved inside the other, the outer one spray painted). I have many of these planters originally made for growing houseplants. 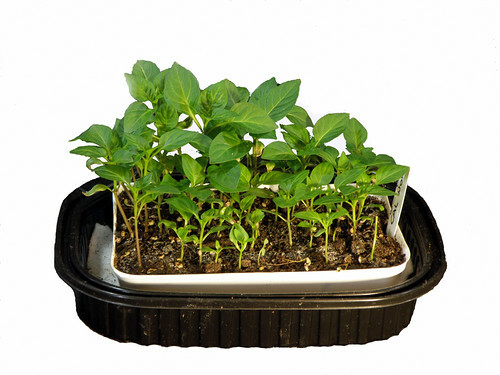 The clear container leaning in the back is used as a hood when propagating the seeds. 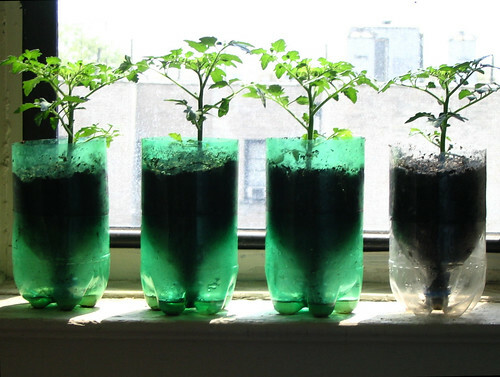 Here is yet another repurposing (recycling) opportunity that will help you grow your own fresh vegetables and keep some more plastic out of the waste stream. Thanks to the economic slump, all reports indicate that vegetable seed sales are booming this spring. Here is a way to start them. You may recognize this seed starter's former life as a barbecue chicken container. Costco sells them by the thousands. Who knows how many. It pained me to trash them until I saw a post on Apartment Therapy. The white seed tray is repurposed (recycled) from Chinese take-out. The wicks are made of polyester batting material (see aquapads). It’s very easy to poke holes with a hot metal skewer and slots with a hot knife. That's all there is to it. Insert the wicking strips and you're good to go. I will post the progress of the seeds in these propagators. Stay tuned. Heirloom seeds have arrived. I'll order Asian veggies today. The next step is to propagate them. 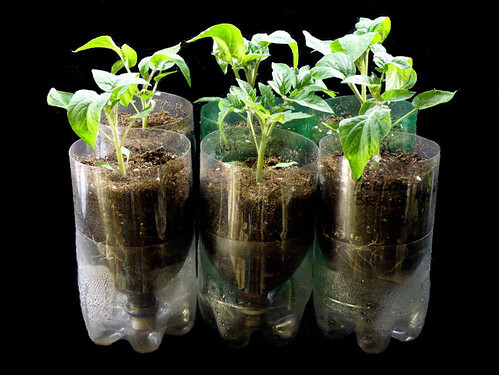 I'm going to use recycled pop bottles and barbeque chicken containers as propagators. Stay tuned. I'll post the progress. 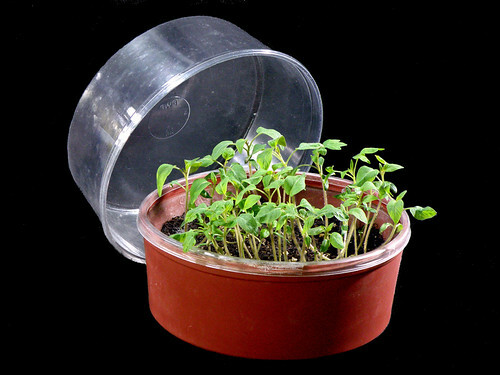 Pop bottle planters with deli container hoods make very good propagators. 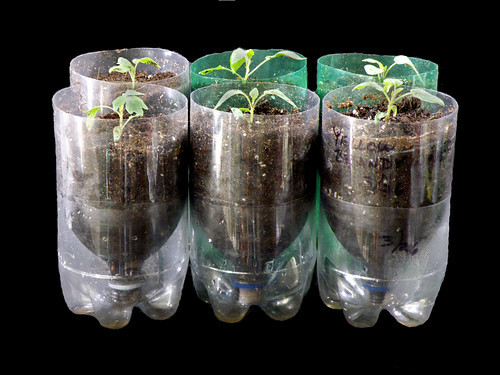 Step 2 will be to move seedlings into pop bottle planters for growing on prior to planting in sub-irrigated growers outdoors. Who knows where the sub-irrigated boxes, beds and buckets will be located later this year. Rooftops, balconies, paved yards and driveways are all possibilities. There is no need for turned earth. It is not going to be just my fire escape this year!